I purchased this welding rod for the first time, but I am satisfied. This review is about item#10019965. I have been using this mild steel since I started the welding work at work. I can not compare because I have never used any other company, but I am satisfied because it is easy to use. This review is about item#10019974. It was a bargain and it was worth the price. This review is about item#7246967. Even an amateur himself could weld it without problems. I think that it is limited to this one for the first time. 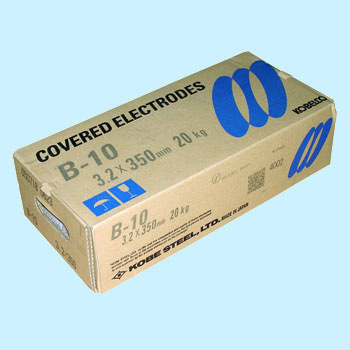 I have been using B-10 since I went to a vocational school for welding. We have patronized with strong workability and back bending products. Technically we do not do welding work only occasionally, but for welding amateur's me, B-10 4 mm will guarantee satisfactory work. This review is about item#10019983. This product was used more than before, but there was a cost problem, Monotaro was applied to the place where I was looking for something cheaper than the home center. This review is about item#07246976. It is a normal item without problems. I am happy that we can buy reliable Kobe Steel welding rods cheaply. With the same item, the price also examined the home center and the net shop, but as the cheapest contractor in the single item purchase, the cost can be lowered, thank you goods.